Whom do you really want to win this fight? Yes, a gamemaster is supposed to be neutral, but you know how you want the adventure to go, so make it work out. Simply describe the other fights in glowing terms, with much hewing off of heads and sundered limbs, while running the player-character battles normally. Thus, if the player-characters are losing when you want them to win, simply describe how their allies are defeating their foes with ease, then turning to assist the adventurers. Similarly, if you want to drive off the adventurers and they are doing well in their own fights, describe the steady attrition of the allies until they find themselves fighting multiple foes, by which time the intelligent adventurers should try to get out of the mess they're in by voting with their feet. Take note of the sentence I've bolded above. I highly doubt that this is the first time that this sort of sentiment appeared in a RPG product. Indeed, I suspect that some enterprising person could probably cite an example of a similar sentence in a product from the first five years of the hobby. Likewise, I think it's pretty clear that advice presented in The Shattered Isle is not intended to be a manifesto of a new way of roleplaying. It's just reassurance for the referee to trust his instincts in ensuring that things "work out" as they should. But make no mistake: this does represent a shift in the conception of RPGs and the role of the referee in RPGs and not one for which I have much liking these days. I think it lends more credence to the notion that the mid- to late 1980s are when certain changes in the hobby became not only widespread -- they were probably popular long before this point -- but when gaming companies began not only to acknowledge but to encourage them. Pulp Fantasy Library: O Ugly Bird! 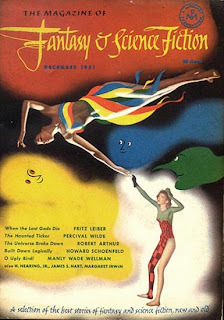 I wrote about Manly Wade Wellman's character of Silver John -- known simply as John in the stories in which he appears -- a year and a half ago. At that time, I hadn't read a Silver John story in a very long time, probably two decades and was going on my memories of reading from the old Arkham House anthology I found at a local library when I was a teenager. Back then, I liked the stories well enough, but I can't say that they really "spoke" to me, in the way that many other stories did. Thanks to Paizo's recent re-release of all the short stories under a single cover, I've had the chance to re-acquaint myself with Wellman and Silver John and I'm glad I did. These are some of the most excellent fantasy tales I've read in a long time. I have little doubt that I'll be talking more about them in the weeks to come. I swear I'm licked before I start, trying to tell you all what Mr. Onselm looked like. Words give out -- for instance, you're frozen to death for fit words to tell the favor of the girl you love. And Mr. Onselm and I pure poison hated each other. That's how love and hate are alike. The story just gets better from there. While wandering "up these heights and down these hollows," John finds himself in a secluded town whose inhabitants are terrorized by one of the townsfolk, the aforementioned Mr. Onselm. Everyone in town is afraid of him and does what he says or else. "One Old Jim Desbro refused him a chicken. Mr. Onselm pointed his finger at Old Jim's mules, they was plowing. Them mules couldn't move ary foot, not till Mr. Onselm had the chicken. Another time, Miss Tilly Parmer hid a cake when she seen him come. He pointed a finger and dumbed her. She never spoke one mumbling word from that day to when she died. Could hear and understand, but when she tried to talk she could just wheeze." John, well-versed in the lore of the mountains (and much else, it's implied), recognizes that Mr. Onselm is "a hoodoo man ... which means the law can't do anything." He then resolves to look into his activities and deal with him, if possible. The problem is that Mr. Onselm has an accomplice, the Ugly Bird of the story's title. It must have hung over us, high and quiet, and now it dropped into the yard like a fish hawk into a pond. First out I saw it was dark, heavy-winged, bigger than a buzzard. Then I saw the shiny gray-black of the body, like wet slate, and how it seemed to have feathers only on its wide wings. Then I made out the thing snaky neck, the bulgy head and long stork beak, the eyes set in front of its head -- man-fashion in front, not to each other. None of the townsfolk are willing to stand up to Mr. Onselm and his Ugly Bird and so it takes the outsider John to do what they cannot, resulting in a terrific tale very well told. Silver John is no mere bumpkin despite his rustic ways. As I noted above, he knows the lore of the mountains, as well as that of other parts of the world. It's hinted that, in his travels, he's learned much occult knowledge and it's his knowledge, along with his purity of heart, that enables him to face down many a supernatural threat. John's a very compelling character, simultaneously mysterious and familiar, the archetypal Cunning Wanderer come to life. He makes a great model for a re-imagined bard class, something I might attempt in the future. Many pulp fantasies, being written in the past, can be difficult to get into. Their style and presentation can be off-putting to readers more accustomed to contemporary fiction. But "O Ugly Bird!" (or any of the Silver John stories) isn't like that at all. The first person narration is very effective and, while John and his interlocutors, use Appalachian, it comes across naturally and is surprisingly easy to understand -- certainly easier than, say, Lovecraft's attempts to convey backwoodsy speech in his own stories. That's because Wellman clearly loved and respected the people and traditions of Appalachia, whereas HPL likely didn't think much of the rural New Englanders he often portrays in his stories. Wellman has a great affinity for his characters and it results in superb fiction that everyone ought to sample, if not drink deeply from. According to a post written yesterday, one of my favorite non-gaming blogs, The Cimmerian, will cease to be on the second weekend of next month. While I fully understand and appreciate the reasons for this turn of events, I'm disappointed nonetheless. While there are many, many other fine Robert E. Howard-focused blogs and forums out there, for me, the Cimmerian will always be the one that connected me to the others. It was a gateway to the world of contemporary pulp fantasy scholarship and criticism and I'm very grateful for its existence. Nothing -- especially good things -- last forever, but that doesn't mean I don't feel a twinge of sadness upon learning of the blog's imminent end. Its bloggers will still be around, of course, most likely relocated to other venues. Likewise, there will still be plenty of REH-focused discussion and commentary at places like the official Conan forums, REH: Two-Gun Raconteur, and REHupa, among others. But make no mistake: an era is ending and I am sorry to see it pass. I suspect I won't be alone in feeling this. As promised, here's the tale of my attempt, a few years ago, to create a RPG based on the worlds of Clark Ashton Smith, specifically Hyperborea, Averoigne, and Zothique. Well before my return to old school gaming, I'd returned to the pulp fantasies I loved as a younger person. I started re-reading authors like Lovecraft, Howard, Leiber, and Smith, among others and began to immerse myself in the new studies of them and their works. It was this process that, ultimately, started me down the path to where I am today, but it would take several more "pushes" from other quarters before I'd make the full leap back to my gaming roots. Anyway, in the course of my reading, I got the idea to write a RPG -- D20-based, of course, as that was the style at the time -- that could encompass the "big three" literary worlds of Clark Ashton Smith. I'd been in touch with a lot of Smith scholars and fans and had even made the acquaintance of Smith's stepson, William Dorman, who serves as director of CASiana Literary Enterprises. Since CASiana is Smith's literary executor, I wrote up a formal proposal to Dorman, laying out my plans for the game and connecting it to an earlier CASiana-sanctioned RPG project, Castle Amber. I also emphasized that, in a time of rising interest in Smith's works, a game based on his works might be another vehicle for making them more well known. William Dorman granted me permission to go ahead with the project. I was ecstatic and set to work. I also contacted a well-known and respected D20 publisher, who were similar enthusiastic about the project and even tentatively lined up an editor who was also an avid admirer of CAS. As plans progressed, it looked like we'd be producing a large, hardcover book that included a simplified D20 variant for its core rules, with modifications for each of the three settings to better reflect their unique qualities. Had the game actually come to pass, I think it would have been excellent, in my biased opinion. So why didn't it happen? Well, looking at least partially to Call of Cthulhu as a model of a well-done RPG based on a pulp fantasist, I figured it'd be nice to include select quotes from Smith stories to frame certain sections of the book, such as, for example, the gazetteers of Averoigne and Zothique. I even considered the inclusion of the full text of a single short story for each section, much in the way CoC includes "The Call of Cthulhu" nowadays. I wrote to Mr Dorman to make certain this was acceptable and received word from him that CASiana has an "understanding" with the publisher Arkham House. This understanding is such that, while CASiana may be Smith's literary executor, it makes no claim to holding the copyright to Smith's actual literary texts. Instead, Arkham House makes that claim and, if I wanted to include any text from Smith's stories, I'd need to contact Arkham House. Naturally, I did. April Derleth, daughter of the company's founder, directed me to someone else, who acted as Arkham House's "literary agent" or some similar title. I can't recall the man's name, but I did get in touch with him. He and I exchange some letters and emails before eventually coming down to brass tacks about the cost of securing the rights to Smith's texts for an RPG. Needless to say, the cost involved was higher than I could justify given the likely return and so, unhappily, I reported this back to the interested publisher. There was brief talk of negotiating for a better deal, but, in the end, all concerned knew it'd hardly be worth it, as this would be a niche product. I periodically thought of returning to the project, after I'd looked more into the copyright status of Smith's stories, many of which are likely in the public domain. I even contacted several Smith scholars to ask their advice and they all agreed that Arkham House's claims over Smith's texts, like those over Lovecraft's, are dubious at best and outright chicanery at worst. However, they all cautioned me against acting without permission from Arkham House unless I had the services of a good copyright lawyer, as Arkham has a history of legally bullying people who try to produce "unauthorized" editions of works they claim to own. I didn't have a lawyer and, even if I had, I wasn't much interested in trying to fend off Arkham House and the project has never gotten anywhere. I doubt I have the permission to produce a CAS-inspired RPG anymore, as it's been years since I was last in touch with Mr Dorman and CASiana. I suppose I could produce a pastiche version of Smith's worlds but, honestly, that's an unsatisfying solution. Part of what motivated me to start this project was a desire to promote Smith's own works, not knock-offs of them. I wanted to get people to read his stories and appreciate his creations. But, alas, it seems as if CASiana, despite being his literary executor, claims no real control over his creations and thus can do little to help me advance that goal. It's a shame, because the game would have been awesome. Early RPGs (generally) borrowed shamelessly from a variety of sources for inspiration rather than being inspired by a single source. Indeed, the advent of RPGs more narrowly inspired by specific sources, not to mention licensed properties, could be seen as yet another sign of the end of the Golden Age. Still, gamers seem to love their licensed RPGs and I once sought out -- and obtained -- permission to produce a game based on the worlds of Clark Ashton Smith (The plan fell apart for reasons I can discuss another time, if people are interested), so I don't think there's necessarily any contradiction between old school gaming and the use of licensed properties. So, what single property do you think would make a good old school RPG and why? One of the great -- and sometimes frustrating -- parts of the old school scene these days is how, even if you're someone like me who spends a lot of time paying attention to it, there's always something you've missed. Despite a long list of established blogs, forums, and purveyors of old school gaming, new ones are regularly popping up, often under my radar. A good case in point is Peter Regan's Oubliette, "a magazine for old school fantasy roleplayers," whose second PDF issue was put on sale (for $2.00) earlier this month. Oubliette is good evidence, I think, that while the old school movement will likely never ignite a second Golden Age, it is having an impact on the hobby. On the magazine's blog, there's a post entitled "Rationale for the magazine" that explains how the editor and his old friends had not been involved in roleplaying for 15 years but returned after discovering Labyrinth Lord. They had so much fun doing so that they're running not one but two campaigns and, inspired by the White Dwarf of old, are producing Oubliette as another outlet for their rediscovered passion for gaming. 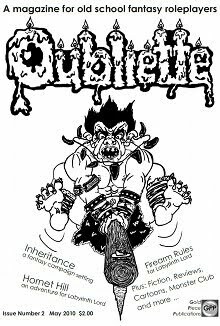 Even if Oubliette weren't a great little gaming magazine, that'd be a success story for the old school movement in my opinion, but, as it turns out, Oubliette is a great little gaming magazine and more than worth the price of admission. Issue 2 is a 50-page PDF whose articles, while ostensibly written for Labyrinth Lord, are easily adaptable to any old school class-and-level RPG. Oubliette has a strong -- and admirable -- "fanzine" quality to it, which is to say, you can almost literally feel the enthusiasm of its creators while reading it. This is no slick but soulless periodical; it's the handiwork of people who love old school gaming and want to share the fruits of that love with others. That's not to say that Oubliette isn't well written, edited, and illustrated, but it definitely reminds me more of the mimeographed or photocopied 'zines I saw in the late 70s and early 80s than the glossy, full-color pages of Dragon before its demise. Its layout is very basic -- "functional," as they say -- and its many illustrations (and comics) remind me of what gaming art looked like in the days before everyone decided that Larry Elmore and his cohort of "fantastic realists" were the acme of illustration. Consequently, Oubliette will almost certainly disappoint many gamers on an esthetic level, but I urge such gamers to look beyond the magazine's appearance and take in its content, which is overall excellent. Issue 2's articles include two installments of a recurring feature called "Monster Club," which details "fun stuff with monsters." One installment presents stats for humanoid, animal, and monster skeletons, while another presents an unusual take on animated statues. There is also an adventure, entitled "Hornet Hill." It's designed for 3rd to 5th-level characters and is, in my opinion, very well done. The town of Swapton is beset by a plague of giant wasps and hires the adventurers to deal with the problem. Part town-based and part wilderness-based (with a small lair thrown in), it'd be great for an evening's entertainment and is a nice change of pace from the more typical "evil humanoids attack an isolated village" scenario. The issue includes two pages of stand-up figures for use with the scenario, as well as 12 pregenerated characters, complete with record sheets. Issue 2 also includes a discussion of how various character classes fit into a campaign setting called "Inheritance." Presumably, this is part of an ongoing series begun in the first issue (which I have yet to see). There's some interesting material here, although I'm not sure how widely applicable it is to other campaign settings. There are also rules for black powder weapons, a magical miniatures shop, reviews of books, music, and TV shows, and the second part of a fictional tale of Sithakk the dwarf. All in all, it's a nice mix of material and all of it, even the fiction which didn't much appeal to me, is suffused with a slightly different sensibility to my own, which I found intriguing. Perhaps it's because the authors are based in the UK, whose take on fantasy has always been a little different, I don't know. Regardless, I like gaming material that feels different, if only because it helps me to break out of my own gaming ruts. I look forward to reading future issues of Oubliette. It's a welcome addition to the old school renaissance and I'm glad I was made aware of it. Buy This If: You're looking for more ideas and resources for use in your old school fantasy campaign. Don't Buy This If: You'd prefer to come up with your own ideas rather than using those of others. No, not that ridiculous Chick tract from the 80s -- the retro-clone of the Rules Cyclopedia version of D&D. As of this very day, it's "officially" done and available either as a free PDF download or as an inexpensive printed volume (hardcover or softcover) through Lulu.com. I've only had a chance to look briefly at the PDF version, but it looks very good indeed. Best of all, it's completely Open Content, meaning that anyone looking to add, say, domain management or mass combat to their own retro-clone projects will find some useful material here. And of course it's even better for players whose preferred version of D&D is the 1991 Aaron Allston-edited compilation of the mid-80s Frank Mentzer-penned rules. Released in 1982, FGU's Daredevils (written by Bob Charrette and Paul Hume, the duo who had previously created the well-regarded Bushido and would later go on to create Shadowrun) was the first "pulp" game I ever remember seeing, let alone playing. In RPG-speak, "pulp" is treated as if it were a genre, usually exemplified by anything from genuine pulp fiction featuring characters like The Shadow and Doc Savage to those inspired by them (or their imitators) in other media, such as Indiana Jones. The pedant in me recoils at this, as pulp magazines covered a wide range of genres and what gamers nowadays call "pulp" is actually only one type of "hero pulp," focusing on what the subtitle of Daredevils calls "action and adventure in the two-fisted Thirties," that is, over-the-top adventure tales between the two World Wars. Alas for nitpickers everywhere, the terminology ship sailed long ago and, accurate or not, "pulp" now means something very specific in a RPG context and, though Daredevils was written before this semantic neologism took had taken hold, it was nevertheless written to give players the chance to explore the Amazon for lost cities, take down flamboyant gangsters in a mob war, and, of course, fight Nazis as they seek out occult artifacts in the world's hidden places. 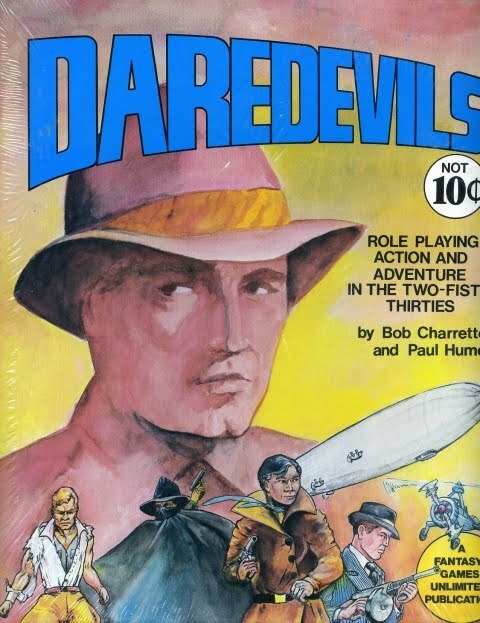 Daredevils came in a boxed set, consisting of two volumes -- a 64-page rulebook and a 32-page adventure booklet with four sample adventures, along with some charts and dice. FGU games have a reputation for being very long and complex, but the reality is that most of them were both shorter in length and no more complicated than the three volumes of AD&D. Daredevils in particular puts this myth to rest, as its rules, while certainly more complex than, say, OD&D or Traveller, are nevertheless quite concise and straightforward. Characters have six attributes -- Wit, Will, Strength, Deftness, Speed, and Health -- and players may allocate 75 points amongst them on a one-for-one basis over a possible range of 1-40. Higher attribute scores than 40 are possible with training and experience. Ranges of attribute scores are grouped, with each group having an "effect die," which was used mechanically in cases where that attribute mattered. Thus, a character with a Strength of 30, which is in the "25-34" attribute group, had an effect die of 2D6 for determining hand-to-hand damage and so forth. Daredevils also had "saving throws," which were really just a type of ability check -- two types, actually, as there were "attribute saving throws" and "critical saving throws." The difference was whether one divided the relevant attribute by 2 or by 3, with the latter being used in cases of extreme difficulty. Players must roll equal to or under the saving throw number on 1D20 to succeed, with 1 being a critical success and 20 being a critical failure. Daredevils had no character classes, but instead had skills. Skills were ranked on 1-100 scale, but skill rolls were made on 1D20, after dividing a skills rank by 5. Sometimes, the difference between the number needed and the result of the dice roll was used to generate an "effect number." It's a game mechanic I'm very fond of myself and I wonder if it was from Daredevils that I got the idea. The number of skills one could purchase (and their ranks) was based on "development points" that were themselves a function of a character's age. Age was determined randomly by a 4D10+12 roll, with the age also being the number of development points a character received. Each development point could be exchanged for a particular game mechanical benefit, such as acquiring a new skill, 2D6 points in an existing skill, or 1D3 points in an attribute. Character generation obviously favored older characters, but characters older than 44 suffered penalties to their physical attributes that limited their effectiveness in some aspects of game play. Daredevils showed that, even in 1982, the hobby's wargames roots were still very close to the surface. Its movement and combat rules were very persnickety, with an emphasis on using miniatures (or markers of some sort) to adjudicate many of their rules. There are many modifiers and optional rules, dealing with critical hits, hit locations, and the like. However, most of them could easily be dispensed with or used only in specific circumstances when the referee felt that the added detail was warranted. Much like D&D, the precise rules could be easily dispensed without too much trouble. On the pother hand, the extra detail is useful. I know my friends and I found the automatic fire rules quite helpful when running a mass battle against hordes of enemy soldiers in a desert scenario. Daredevils includes optional rules for "special powers" -- low-level super powers -- and luck, the latter of which is a limited type of "hero point" system. Also included are details on the 1930s world, lists of animals, weaponry, generic NPCs, and some solid advice on building adventures. Advanced rules of various sorts are present as well, for players and referees who want them. What's interesting to me is that the rules include a wide variety options for character improvement, many of them time-consuming. As befits an older RPG, Daredevils is clearly designed with long-term campaign play rather than one-shots in mind, although I think Daredevils could be used quite creditably for short campaigns as well. Daredevils is a very fun game, not without its flaws, but I think it holds up rather well after nearly 30 years. The rules are a nice mix of randomness and player choice and support a range of options. It's also a game from a time before "genre emulation" meant heavy-handed rules designed to enforce a particular mode of play. It's a wide-open game that can be used to handle a wide variety of action and adventure campaigns, a fact FGU built upon with its several follow-up products that each presented scenarios focused on a particular sub-type of hero pulp. If you're interested, the game and its supplements are still available from FGU at very reasonable prices. I recommend them highly. The photograph to the right is of actor William Richardson, better known to the world by his stage name, Darren McGavin, in probably his most famous role (at least among people of a certain age), that of reporter Carl Kolchak from the 1974-1975 TV series named after him, Kolchak: The Night Stalker. I have a copy of this very photo, autographed by McGavin himself, still hanging on the wall of my old bedroom at my parents' place in Baltimore -- "To Jimmy, Darren McGavin." I was probably six or seven years-old when my favorite aunt wrote to McGavin via ABC about my love of the series, which I watched in reruns a couple of years after it had been canceled. Needless to say, I was ecstatic to receive it and it's been one of the prize possessions of my childhood ever since, right up there with my French language edition of the D&D Basic Rules autographed by Gary Gygax. I don't ever recall seeing the TV movies until I was much older, but I adored the TV series. After receiving my birthday gift, I watched the entirety of the series -- all 20 episodes -- over the course of several days, the first time I'd seen many of them in over two decades, maybe longer. Sad though it is to say, the vast majority of the episodes are simply terrible in almost every respect. Certainly McGavin and co-star Simon Oakland always give engaging performances and many of the special guest stars -- a veritable who's who of '70s era actors -- were obviously having fun with their roles, but the stories themselves are, with a few exceptions, awful B-movie level plots that don't hold up to even the most minimal scrutiny. But, as a kid, I loved this show, probably because I found it just frightening enough. The episodes rarely showed much of anything gory or grotesque, partially due to their limited budgets and partially due to the constraints on TV in that era. While unsatisfying to my adult self nowadays, it was perfect for me as a child back then. My mind filled in all the details, resulting in some lasting impressions of how much more scary some of these episodes were than they actually are. A favorite of mine was "The Spanish Moss Murders," which dealt with a swamp monster from Cajun legend called Père Malfait. The episode give me the willies as a kid. Many of its scenes, such as the monster rising up out of the water in the sewers beneath Chicago, scared me a great deal in my youth. They seem almost laughable now. My fondness for the show is nevertheless undiminished, as it was an early cobblestone on the path that led me to my lifelong love of fantasy, horror, and science fiction. Though I'd never claim Kolchak: The Night Stalker was a good show in any absolute sense, it was a good show for me. It was a superb propaedeutic for an elementary school student fascinated by scary stuff even as he was frightened by it. And, for all its faults, the show had an impact on D&D. Gary Gygax admitted on more than one occasion that the inclusion of the rakshasa was due to his having seen the episode "The Horror in the Heights," in which the demon from Hindu legend figures prominently. That's got to count for something. So, as you can see from the picture to the right under "What I'm Reading," I'm enjoying Paizo's recent collection of all of Manly Wade Wellman's "Silver John" short stories, about which I posted briefly a year and a half ago. They're frankly among the best fantasies I've read in a long time, so much so that I'll probably be discussing several of the tales at length in upcoming installments of my "Pulp Fantasy Library" series. Wellman was a superb stylist and his gift for realistic, natural dialog is matched by very few authors. Combined with his knowledge of the history and folklore of the Appalachians, his Silver John stories make for great reading. And now that I've praised the stories and touted you onto the novels, let me tout you off something. 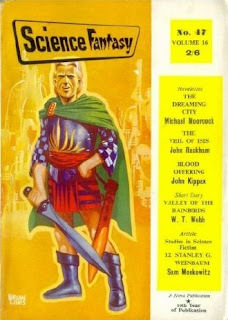 Hollywood made a film version of the Silver John stories, done with Hollywood's usual taste and respect for the material. It is called The Legend of Hillbilly John, and the change from Silver John to Hillbilly John pretty much says it all. John would next appear on film, with folksinger Hedge Capers miscast as John. The film was partially shot in Madison County, North Carolina (the general setting of the John stories) in October 1971. Despite a surprisingly good supporting cast and the incorporation of two of the best stories ("O Ugly Bird!" and "The Desrick on Yandro"), the film was an embarrassment -- largely due to its shoestring budget and stultifying script. It was released in 1972 as Who Fears the Devil and flopped at the box office. It was the re-edited and re-released the following year as The Legend of Hillbilly John, with equal success. Sometimes it turns up on videocassette. What's sad is that I think the stories of Silver John would make for great cinema, either on the big or small screens. The stories are well written and focused, with superb characterization and dialog and mixing horror with a deep love for the people and traditions of the mountains in which they take place. I imagine very few people in Hollywood these days have any interest in these things -- more's the pity. Even so, is it wrong of me to want to hunt down this movie and watch it? Looks like I've managed to snag myself a copy of the Ringworld Companion to go alongside the game. That's a step in the right direction. I'm still seeing if I can find a copy of the Hawkmoon boxed set without having to buy from one of the used games sellers (not that I mind doing so, but their prices tend to be somewhat higher than those obtainable through other means), I'll have (mostly) sated my recent Chaosium RPG lust. Richard Guy, a long-time correspondent of mine (and the fellow who's lent me his copy of Chivalry & Sorcery) sent along this link way back in March and I filed it away with the intention of making a post about it later. Obviously, more than two months later, I never did, so I offer it now as inspiration for anyone looking to build their own "imaginary labyrinth 650 miles square." Science fiction writer David J. Williams has begun a series of posts over at Tor.com, where he's looking at old school RPGs. The first two installments focus on two classic SF RPGs, Traveller and Metamorphosis Alpha. It's great to see these roleplaying games getting wider exposure on non-gaming sites, so, if you have the chance, pop over and leave a comment, so that the good folks at Tor know that articles like this are well-received. You may well recall the image to the left, as it was one of the earliest installments in what I'd then dubbed "Pulp Fantasy Gallery," a recurring feature intended to highlight the artwork associated with the classics of pulp fantasy on which D&D was founded. It didn't take long for me to rename the feature to what it is today, in part because I'm an even poorer critic of art than I am of literature, but also because, sadly, much of the artwork associated with pulp fantasy is pretty uninteresting to me. I honestly didn't think I could have sustained a weekly series by discussing art alone. Others might be better suited to that task, which is why I've stuck with discussing (largely) written works whose ideas and stories struck a chord with the founders of our shared hobby. Because of the original post cited above, I've never actually tackled an Elric story as part of this series. That's odd, because there's little doubt that the Elric saga had a clear and powerful influence on early D&D (and not just its alignment system). It's odd too given how much I adore Chaosium's Stormbringer RPG. Likewise, the Elric saga is, in my opinion, a textbook example of the dangers of success, a topic near and dear to my heart, as you well know. So, when I woke up this morning and read Dan Collins's excellent post on "Elric and Art," I knew today was the day to write my own post on the first Elric short story, "The Dreaming City," which appeared in the June 1961 issue of Science Fantasy. For ten thousand years did the Bright Empire of Melniboné flourish -- ruling the world. Ten thousand years before history was recorded -- or ten thousand years before history had ceased to be chronicled. For that span of time, reckon it how you will, the Bright Empire had thrived. Be hopeful, if you like, and think of the dreadful past the Earth has known, or brood upon the future. But if you believe the unholy truth -- then Time is an agony of Now, and so it will always be. It's a terrific opening and one that really sets the mood for both the setting and the specific story Moorcock is about to tell. Equally terrific is the first description of Elric, which in my opinion matches Howard's justly famed description of Conan (which seems appropriate, given Elric's origin as, at least in part, an "anti-Conan"). What's most interesting about "The Dreaming City" is that the story it tells, that of Elric's invasion of Imrryr, capital of the Bright Empire, with the aid of sea raiders in order to defeat his cousin Yyrkoon and rescue his lover Cymoril, who's been placed in an enchanted sleep by Yyrkoon, her brother. Thus, Elric's saga begins with the climactic battle between his chief nemesis. Yyrkoon's eventual defeat at Elric's hands is thus the starting off point for what follows rather than the conclusion to it. This should come as little surprise, given that Moorcock wanted, by his own admission, to turn many of the timeworn convention of swords-and-sorcery fiction on their heads and so he does here. Elric, as presented in "The Dreaming City" is a weak, decadent albino whose power comes as much, if not more, from sorcery and pacts with demonic entities, as it does from his blade. Were he in a Conan tale, he would almost certainly be an antagonist and, even in "The Dreaming City," he comes across as not wholly sympathetic. He is, after all, a man willing to betray his own people, leading others to sack the unconquered city of Imrryr in his personal quest for revenge. "Imrryr fell, in spirit, five hundred years ago -- she will fall completely soon -- for ever! I have a little debt to settle. This is my sole reason for aiding you. As you know I have made only a few conditions -- that you raze the city to the ground and a certain man and woman are unharmed. I refer to my cousin Yyrkoon and his sister Cymoril ..."
Yyrkoon has usurped Elric's throne while the albino sorcerer was away, wandering among the sneeringly named Young Kingdoms, the "lesser" states that have grown up in the shadow of Melniboné and whose powers have waxed while the Bright Empire's have waned. Unlike others of his race, Elric appreciated "the less sophisticated pleasures of the outside world," but he also felt "the pulse of his ancestry beat strongly in his deficient veins," equally appreciating the dark beauties of his own culture. Speaking for myself, I find Elric a very ambiguous character, as I am sure he was intended to be. Though perhaps less cruel than his kinsmen, he is nevertheless a cruel character, one whose intensely personal drives lead him to the ruin of others, even those he least wishes to harm. It's possible, I think, to be sympathetic with Elric at times, but it's difficult to like him unreservedly. He possesses a powerful, raw appeal nonetheless and it's not hard to understand why he struck a chord with many readers only familiar with the often unimaginative pulp fantasy heroes who rose to prominence during the 40s and the 50s. There's no question that Elric was different and fantasy readers were ready for different. Unfortunately, he also proved so successful that Moorcock could never abandon him, leading to ever more ridiculous stories featuring the character, the vast majority of which aren't, in my opinion, particularly good. Over time, Elric has become every bit as much a caricature of himself as had Conan under the guidance of L. Sprague de Camp. The much-reviled Drizzt Do'Urden may be laughable to a lot of us, but he would never have been possible without Elric, who firmly established the angsty, good-member-of-an-evil-people as a fantasy archetype. None of this, though, undermines the genuine goodness of "The Dreaming City," which remains every bit as good as it probably was in 1961. Indeed, if anything, it's probably better now in some respects, since all of us who've suffered through the later Elric stories can return to it and its immediate sequels to remember that, once upon a time, Elric really was an interesting character and Moorcock was a visionary writer whose stories positively crackled with taut prose and amazing ideas. I was away for a good portion of today, owing to a family obligation, but I brought along with me as reading material the three rulebooks that make up the second edition of Chivalry & Sorcery, which I have on indefinite loan from a long-time correspondent. I'd read select portions of the rules before, but I'd never read them all cover to cover until today. In doing so, a few thoughts occurred to me. As I've noted before, "old school" is not, despite the preferences of a great many old school bloggers, the equivalent of "rules light." Plenty of old school games -- the entire FGU catalog, to cite just a few examples -- were quite complex. Now, it's perfectly understandable that, in the face of monstrously exhaustive modern RPGs, many of us have sought refuge in the comforting arms of simpler games. Simplicity is a common element of old school RPGs, but it's not, I think, a defining element and it does us all a disservice to imply that it is. Reading C&S reminded me once again that complexity is not anathema to old school gaming and indeed many complex games better illustrate other characteristics of the Old Ways better than do simpler ones (the preference for multiple, distinct sub-systems rather than a unified mechanic, for example). I also found myself more strongly compelled to give C&S a whirl than I ever have been in the past. I'm not entirely sure why, as, in many ways, it's a pretty bland, flavorless game. Its distinctive elements were its very involved character generation, combat, and magic systems and its "realistic" treatment of medieval society as a backdrop for fantasy adventuring. Yet, somehow, this mixture started to work for me and I began to imagine that it might even be fun to play a game like this. Perhaps I'm merely sleep deprived, I don't know. In any case, between this experience and my recent inquiries into Gygax's Dangerous Journeys, I am starting to think that one of the things the old school renaissance has really yet to produce is a complex, even rules-heavy RPG. To date, the scene has been obsessed with "simplicity." Again, let me stress that there is great virtue in simplicity; it's definitely my preferred approach to rules design. But, that said, there is room -- perhaps even a need? -- for a game built on old school principles that bucks the notion that "old school = rules light," because that was never true. Over at Terminal Space, Albert Rakowski has just begun a series of posts providing alternate names for D&D magic-user and cleric spells. Each spell has three different variants -- arcane, mystical, and demonic -- each of which lends a different flavor to it without changing its mechanical effect in any way. This is a great idea and one I've often thought of adopting myself. Anyone who's familiar with Empire of the Petal Throne's Tékumel will know that many of its spells are little more than renamed OD&D standbys, but their new names are so beautifully evocative that they seem so much more interesting. D&D's spell names are (mostly) very bland, almost clinical. I don't think that's a problem in and of itself. As a baseline for discussion amongst players, it's probably much simpler to talk about fireball rather than, say, the inexorable conflagration of Thoom or something similar. But, except in certain circumstances, I find it pretty boring to say, "I cast magic missile" or "I use cure light wounds" in play. It does very little to evoke a fantasy setting and in many cases reminds us that we're playing a game with rules. So, what Albert is doing is, I think, a great example of what I wish we saw more of in individual campaigns: tailor the baseline spell list to the setting. I'll probably do it for the Dwimmermount campaign at some point, if not for the current campaign, then for a future one. It's something I'd intended to do all along but never got round to doing. Perhaps it's time to correct that. Sorry for the delay in posting this Friday's question, but I'm busy and distracted. Anyway, here it is: was your first character created "fairly," which is to say, without any fudging of any of its random elements? Obviously, this question only applies to people whose first games include random elements in character generation, but, if yours didn't, I would like to know what your first RPG was and how its lack of random elements in character generation has influenced your thinking about creating characters. As usual, I'm offline for the day. Expect posts, email, and comment replies to resume over the weekend. Obviously, it is possible for a player to generate a character with seemingly unsatisfactory values; nevertheless, each player should use his character as generated. The experience procedures and acquired skills table offer a genuine opportunity to enhance values, given only time and luck. Should a player consider his character to be so poor as to be beyond help, he should consider joining the accident-prone Scout Corps, with a subconscious view to suicide. While I'm sure lots of us will be drawn to the comment about suicide, far more fascinating, I think, is the comment about "seemingly unsatisfactory values" and the use of "should" in reference to playing a character as generated. These both point to a philosophy of game play and design that's quite different to the one that's become dominant in the last couple of decades. I'll probably have more to say on this later, but I'm rather busy at the moment and might not have a spare moment till the weekend. I think it's rare for someone to reach the age of 40, as I have, and not have regrets about past decisions. I've got more than my fair share, I think, but one of the ones -- a fairly inconsequential one, in the grand scheme, to be sure -- I've been thinking about lately is my periodic obsession with cleaning my gaming "house." This begins every so often when I look at my shelves, see a game, and say, "I'll never play that again." Then, I take the game (and its supplements) off my shelf and sell it, give it away, or, in some extreme cases, throw it into the garbage. Of course, a few years later, I'll remember these games and wish I hadn't gotten rid of them. It's pretty much guaranteed to happen and yet, until recently, I don't think I really learned my lesson. Now, my garage is filled with plastic boxes of games I haven't played in years and likely won't ever play again, but I'm no longer willing to take that chance. I remember all too well, back in 1987, shortly before I graduated from high school, selling off my entire collection of Traveller books and games, because I'd fallen in love with GDW's Traveller: 2300 (as 2300 A.D.) was called at its release. I simply loved the game, which seemed so much better and more "up to date" than the stodgy old Traveller with its Golden Age SF conventions. I figured I'd never play Traveller again and, since I was going away from home to college soon, I'd need to pare down my RPG collection anyway. Needless to say, I eventually had to re-acquire those Traveller books and games, often at great expense, and some of them I've still never managed to get a hold of. Traumatic (and embarrassing) though this was, it wasn't the last time I unloaded lots of RPGs I was sure I'd never use again, only to be proven wrong sometime later. Nowadays, I nearly weep for these lost treasures, particularly my old D&D and AD&D products. So, I no longer pitch almost any game I own, even the obviously bad ones. You never can tell when you might want to look at a copy of Greyhawk Adventures again and God help you if you have to pay a second time for stuff like this. I have a great fondness for historical RPGs, but, judging by their success in the marketplace, most gamers don't seem to share my affection for them. That's a pity, because it's meant that they've missed out on some truly excellent games published over the years. A good case in point is 1982's Gangbusters, written by Rick Krebs and Mark Acres, with additional design by Tom Moldvay. 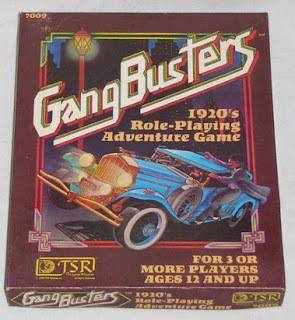 Subtitled the "1920's Role-Playing Adventure Game," Gangbusters was about the the battles -- both literal and figurative -- between law enforcement and organized crime during the Prohibition era. Players could take up the roles of cops, FBI or Prohibition agents, private eyes, reporters, and, of course, criminals, as they engage in the sorts of mayhem seen in Edward G. Robinson and Jimmy Cagney movies. There were lots of things that made Gangbusters a remarkable game. Chief among them was its simplicity. Though the rules touched upon nearly every topic imaginable for a RPG of this type, from gunfights to car chases to trials to public opinion and more, it did so in a succinct (64 pages! ), straightforward fashion that never lost sight of the fact that a game about mobsters needs to be freewheeling and fun. Though characters had "careers," which gave them access to certain limited powers and abilities (such as a police officer's power to arrest, for example), ability scores and skills -- both of which were percentile -- played a much bigger role. A character's current career did, however, determine how he acquired experience points. Thus, a cop gains XP for arresting criminals, while a reporter gains them for writing stories that have a significant in-game effect. Characters could freely change careers, of course, but turning criminal had negative consequences, making it typically a one-way street. Gangbusters characters also possessed levels, but their mechanical effect was small, serving primarily as a gauge of social importance and influence (along with granting points to spend on character improvement, which was small and slow). If Gangbusters had a flaw, it was the fact that it assumed adventures and campaigns would take place within a fictitious city on the shores of Lake Michigan called Lakefront City, a kind of smaller, ersatz Chicago, whose precise location in the US was never specified. While there certainly are benefits to this approach, particularly in allowing the setting to have its own history divorced from what happens in the real world, it also lent an air of unreality to the game, at least in my experience. I would have much rather seen overviews of several different American cities from the era, with brief discussions of how campaigns set in each would have different flavors. In my home campaign back in the early 80s, I abandoned Lakefront City in favor of my hometown of Baltimore, spending a lot of time in the library doing research on the various personalities of the time, especially its mobsters, who, while perhaps less well known than Al Capone or John Dillinger, nevertheless had the benefit of being real, unlike Gangbusters' Al Tolino. But I quibble. In the end, Gangbusters is a fun, unpretentious, little game that's both true to its inspirations and eminently playable. Its rules strike a terrific balance between providing too much and too little detail, while at the same time highlighting everything that's essential to playing a campaign about gang wars during Jazz Age America. As a younger person, I found Gangbusters gave me the appropriate amount of nudging in the right direction so that I could create adventures that felt like the books and movies that inspired it. In the process, I not only learned a lot more about American (and Baltimore) history, but I developed a love for gangster flicks that continues to this day. These are quite impressive feats, which is why, though I haven't played it in more than 20 years, I still rank Gangbusters among the best RPGs I've ever owned and played. It's a true classic. I'm also on the lookout for reasonably priced copies of Gary Gygax's Dangerous Journeys books. I keep hearing, from sources whom I generally trust, that there's a lot of good stuff to be found in this game and its supplements. I'll admit to being skeptical, as I'd looked at them briefly during the 90s when they were released and saw what looked like an unnecessarily complex game that used an invented vocabulary to describe many of its basic concepts -- two things that didn't interest me in the slightest, despite Gary's name on the cover. But, like a lot of things, I'm prepared to re-evaluate my opinion on the matter. I just need to get hold of the books to do so and they seem strangely scarce and/or expensive through the usual methods I employ to find out of print gaming products. So, if anyone has any leads on these books at reasonable price, please do let me know. 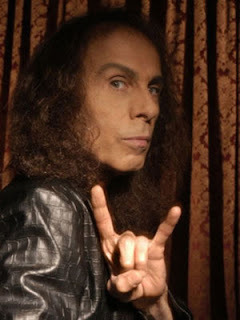 Over the last few days, old school blogs and forums have been ablaze with tributes to the late heavy metal vocalist Ronnie James Dio, who died on Sunday from stomach cancer at the age of 67. I've talked before about how, when I was a younger man, roleplaying was one of the few places where metalheads and geeks rubbed shoulders amicably. My friend's headbanging older brother was an early gaming mentor of mine and it was through him that I first became acquainted with heavy metal music and culture. I can't say that I had much liking for it; my musical tastes, then and now, are too staid to appreciate metal, I think. But I am at least more than passingly familiar with the music, bands, and personalities of heavy metal from the late 70s to mid-80s. Unsurprisingly, this period coincides with my formative years in the hobby. In those days, D&D and metal went hand in hand, both in the popular imagination and in reality. It was rare to find a gamer who either wasn't into heavy metal or had gamers in his group who weren't. And the metalheads too. Most of these guys were younger than the wargamers -- teenagers or college students generally -- but they were just as into Conan and Cthulhu as the bearded, middle aged Avalon Hill/SPI crowd. These were the guys who had Frazetta on their walls right next to their Black Sabbath concert posters. A lot of them were big into Tolkien too, oddly enough. They definitely had style gaming-wise: their characters were always interesting and their dungeons always deadly. Though they could be scary, at least to me and my buddies, they really did seem to possess a strange kind of ardor, sparks of adolescent brilliance that I found strangely compelling. And far from fulfilling the stereotype of teenagers who believe they are immortal, many of these guys had a peculiar melancholy way about them that came through in their doomed yet heroic characters. It's heady stuff when you're an introverted, nerdy kid in the early 1980s. The metalheads were a big part of the common culture of the hobby when I entered it. Though I never shared their love for the music, they rarely made me feel as if I were an outsider. Many of my earliest gaming memories include a heavy metal gaming soundtrack, not because I was into the music myself but because my friends were and it was part of what it meant to be a gamer back then -- just like Conan or Cthulhu or Fafhrd and the Gray Mouser. I really cherish those memories; they remind me of a time when the hobby was smaller and yet somehow felt broader than it does now. They were good times and I often miss them. So, I bid farewell to Ronnie James Dio alongside my fellow old schoolers and offer the horns in salute to him and to his many fans who gamed with me so long ago. Albert Rakowski has just released a 40-page PDF supplement to OD&D called Terminal Space. It's available for free and, having spent a lot of time reading it last night before bed, I can say that I'm very impressed. As noted, it's not a complete game but instead provides additional rules to expand OD&D into the science fiction and science fantasy genres. So it includes some new character classes, equipment, alien creature creation and starship rules, and more. Reading it, I found myself amazed at how much material Albert had managed to pack into 40 pages. As someone who's written his fair share of RPG products over the years, including SF ones, it's more than a little humbling to watch someone else do so much with so few words. As with OD&D itself, Terminal Space is a masterpiece of concision and makes demands on referees and players alike to fill in the gaps. Fortunately, that's very much my style these days, so I have no complaints, but anyone expecting an exhaustively detailed, ready-to-run game may be disappointed. I'll probably talk in more detail about Terminal Space later this week. It's a really amazing piece of work. I wish I'd thought of it. If I had it to do over again, I'd probably not have included dwarves or elves in my Dwimmermount campaign. It's not that I really object to their presence -- this is a D&D campaign, after all -- but, as the sessions add up, I find that certain elements of the setting would probably have worked better if humans were the only playable races. For example, death, dying, and the quest for immortality have all become important elements of the campaign, with the the appeal of the cult of Turms Termax being at least partly based on its promise of eternal life to its elite members. But the lengthy lifespans of demihuman races undercut the cult's appeal somewhat, even if neither dwarves nor elves are truly immortal. Now, as I always do, I've begun thinking about ways to address this within the campaign setting and the result might, in the end, be more satisfying than the straightforward approach I could have adopted in a human-only setting. Still, there's little question that it would have been simpler (and truer to my inspirations) if I'd ditched demihumans at the start. On the other hand, part of what makes D&D the game that it is is its selection of playable demihuman races. You can get rid of them or replace them with others, of course, but, the more you change that "starting lineup," the farther you drift away from the peculiar kind of fantasy D&D evokes. So, there's a balance to be struck, I guess, between leaving too much unchanged for tradition's sake and changing so much that the result is unrecognizable. More food for thought, I guess. "You -- who are -- you?" her words came in gasps. "Naught but a wanderer, a landless man, but a friend to all in need." The gentle voice sounded somehow incongruous coming from the man. Kane learns from the nameless woman that a gang of bandits led by one calling himself Le Loup had attacked and burned her village to the ground. She fled into the forest to escape but the Wolf and his men eventually caught up her. She then dies and Kane says, as if in reply, "Men shall die for this." The story resumes some time later, as Le Loup's men have begun to grow frightened of Kane -- "a demon from hell," they call him -- who has been stalking them and picking them off, one by one. "He hunts us down as a wolf hunts deer -- by God, Le Loup, you name yourself Wolf but I think you have met at least a fiercer and more craft wolf than yourself! The first we know of this man is when we find Jean, the most desperate bandit unhung, nailed to a tree with his own dagger through his breast, and the letters S.L.K. carved upon his dead cheeks. Then the Spaniard Juan is struck down and after we find him he lives long enough to tell us that the slayer is an Englishman, Solomon Kane, who has sworn to destroy our band! What then? La Costa, a swordsman second only to yourself, goes forth swearing to meet Kane. By the demons of perdition, it seems he met him! For we found his sword-pierced corpse upon a cliff. What now? Are we all to fall before this English fiend?" Naturally, Le Loup is confident that, however clever and resourceful Kane may be, he is, after all, just a man and, like all men, prone to weaknesses he can use to his advantage. Of course, the bandit begins to wonder whether he might have been wrong when the Puritan corners him in his lair. Le Loup simply cannot understand Kane's actions. "Who was the girl?" he asked idly, "Your wife?" "Nom d'un nom!" swore the bandit. "What sort of man are you, Monsieur, who takes up a feud of this sort merely to avenge a wench unknown to you?" Le Loup tries to bribe Kane with a share of the wealth he and his now-dead men had stolen, but his foe will not be dissuaded from his pursuit of bloody justice. The bandit does, however, distract Kane just enough to be able to escape into the dark recesses of his cavernous hideout, but, as he should have known well by this point, there is no true escape from Kane. Le Loup flees Europe for Africa and still the Puritan follows him. It's in Africa that Solomon Kane meets N'Longa, a "ju-ju man" who will become his friend and a recurring character in later tales. It's also in Africa where Kane at last catches up with Le Loup and their final confrontation occurs. Solomon Kane is a fascinating character. Speaking for myself, I find him at once more attractive and more repulsive than Conan. His ideals are far loftier than those of the Cimmerian, but the methods he uses in pursuit of those ideals seem very much at odds with them. Whereas Conan, at his worst, is largely venal and self-interested, Kane seems to veer toward the vicious, his zeal for "justice" becoming so overwhelming that it allows no place for mercy or compassion. Howard seems very much aware of this fact, calling Kane "a true fanatic" and yet he doesn't fail to portray Kane sympathetically. Indeed, "Red Shadows" and the stories that follow go to some lengths to show Kane as more than a red-handed avenger, particularly through his friendship with N'Longa, which is a fair bit more complex than a surface reading would suggest. 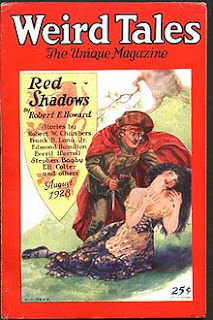 "Red Shadows" isn't Howard's best story. It's not even his best Solomon Kane story. Nevertheless, there's something very powerful in its words, something archetypal that I find very compelling. I suspect that most of us have, at one time or another, hoped that Justice might be dealt to some evildoer with extreme prejudice and Kane speaks to that hope. He also speaks, I think, to our fears that our cries for "justice" are all too often a mask for revenge, a desire that can taint our loftiest notions and reveal us as no better than those we denounce. I honestly can't say that Howard would have agreed with me; indeed, I rather suspect he would not have. I don't think that changes the fact that, as written, Solomon Kane isn't just a 17th century Paul Kersey and to reduce him to such is to do him -- and his creator -- a disservice. Looks like I've managed to snag myself copies of the Stormbringer Companion for the 1st edition of the game and Demon Magic (which is, I believe, for the 2nd edition) for reasonable prices. This makes me very happy. Are there any other supplements for Stormbringer worth getting, bearing in mind my preference for the 1st-3rd editions of the game? I'm still trying to snag a copy of Pavis & Big Rubble, as well as Hawkmoon, though the latter looks to be a lot easier to find than the former. 1. As a reminder, Open Fridays are a replacement for my daily posts on Friday when I'm offline. I write them in advance and don't participate in the comments because I don't see the comments until the next days, by which point they're usually too many in number for me to even hope to keep up, assuming I ever intended to do so (which I didn't). 2. That said, my own personal candidate for an underappreciated pre-1984 RPG is probably Stormbringer. Lots of people know about the game's existence -- note I said underappreciated -- but, in my experience, its virtues are not well-known. It was overshadowed by its "big brother," RuneQuest and many gamers dismiss it as a licensed game, either because licensed games are often poor or because they had little interest in the world of Elric. Neither is true in the case of Stormbringer, which both shows the flexibility of the Young Kingdoms as a setting and has really evocative rules for dark fantasy even if you choose to play the game "generically." 3. On the subject of energy drain, I'm still very divided. I like many of the suggestions offered by people in the comments, some of which look elegant mechanically and intriguing from an in-game perspective. However, despite my misgivings, I've yet to decide to abandon the existing mechanic, which, as other people have shown, work from both perspective, or can anyway, with some work. So, for now, energy drain stays in Dwimmermount as written. Name a single RPG published before 1984 that you think deserves wider recognition than it's received to date and briefly state why in the comments below. I've never really had any serious problems with level-draining creatures in D&D. Granted, it's a very deadly form of attack, but I think there ought to be some very deadly attacks in the game. That said, perhaps under the baleful influence of RuneQuest, I've started to question level-draining on two fronts. 1. On the purely mechanical level, I'm slowly coming round to the point of view of Dan "Delta" Collins that most, if not all, magical effects ought to grant a saving throw. I think saving throws tend to be undervalued in D&D and should be used more broadly. There are plenty "save or die" effects in the game, so why should something like level drain not grant a save as well? I certainly can see arguments against granting one -- and that's how I currently use level drain -- but I'm not convinced that the danger the attack is supposed to have is lessened by the possibility that a character might, with a good enough roll, escape it this time he's struck by a wight. 2. On a naturalist level, what exactly does level drain represent? It's here, actually, where I find the case against the current implementation of the ability to be strongest. I really like the notion that some types of undead are so evil and reality-warping as to be able to wreak devastating damage on their opponents, but level drain seems very mired in game mechanics. No characters in the settings of my campaigns talks about character levels; they're purely a construct of the rules (unlike spell levels, which I at least take to have a meaning within the game world). So, what precisely is it that a level drain is doing within the context of the world? How can you explain it without recourse to the rules? I don't have any answers to these questions yet, but I'm increasingly leaning toward both allowing a saving throw for level drain and substituting something other than levels for the drain. I don't think this is unwarranted and, done correctly -- permanent hit point or ability score drain, for example -- the effect would be just as deadly and more (potentially) explainable within the context of the setting (Yes, yes, I know hit points are a problematic concept too; I'm just thinking out loud here). Still, there's also a part of me that rebels against the notion of changing level drain. It's one of the few attacks in D&D that genuinely puts the fear of God into even the most foolhardy players and encourages cleverness to avoid it. I like that and would hate to lose it. But it feels like such a clunky, frame-breaking mechanic that I have find myself wanting to find a way to make it work in ways I find less problematic. Anyone else have any insights here? Scott Driver, formerly of the Wilderlands of OD&D and World of Thool blogs (neither of which still exist, alas), has returned to the old school scene after a much needed break. His new blog, called Mandragora: The Mandrake March details a new setting for his Moldvay/Cook campaign, one whose tone he describes as "the Brothers Grimm joins the Judges Guild." That sounds pretty neat, if you ask me. I'm a big proponent of including locations of special interest in my dungeons. Generally, these are mysterious and/or beneficial places that hold something that brings the characters back to it again and again. An oft-mentioned example of this from the Dwimmermount campaign is "the Cleric Tree," a weird, azoth-warped subterranean growth that, if properly tended to, yields "fruits" that function as potions of healing. Early on in the history of the campaign, the party discovered this growth, unlocked its secrets, and regularly returned to it in order to take advantage of its boons. In practical terms, this meant that, even as the characters delve deeper into Dwimmermount, they still have reason to return to earlier levels, which in turn gives me the opportunity to present the place as a living environment rather than a static one that can be "cleared" with enough effort. To my mind, this presentation is one of the key differences between a "megadungeon" (or campaign dungeon) and a mere "dungeon" (or lair). Another special interest location is the Moon Pool, a shallow pool in a series of caves inhabited by a tribe of mutant kobolds. 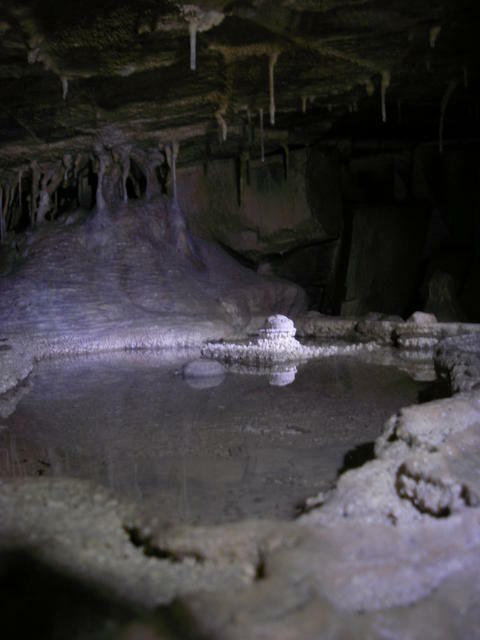 The cave in which the Pool is located has a small opening in its roof through which moonlight can shine, reflecting in the Pool. The Pool itself holds what alchemists refer to as "true water," a primordial liquid untainted by physical contaminants and that cannot be destroyed or have its state altered. Thus, it does not evaporate and cannot be frozen with even the mightiest of spells. On the other hand, true water is a supernatural solvent (which is why alchemists prize it), dissolving magical energies within itself. "+1 caster level" means that, for spells that have variable effects based on level (e.g. fireball), the caster is treated as one level higher than he actually is. "+1 spell" means that the character gains an additional spell of the type indicated (lowest/highest level) for the duration the Moon Pool's infused water is in effect. Obviously, effects stated as a penalty (e.g. "-1 caster level") function in reverse. A character who drinks from the Moon Pool must make a saving throw against Spells or Radiation. Success indicates that the effect listed above is operative, according to the current phase of the moon. The effect lasts for a number of days equal to 1 plus the difference between the saving throw number and the number rolled by the player for his character. For example, a 6th-level magic-user requires a 12 to save against Spells or Radiation. If his player rolls 14, the appropriate effect lasts for 3 days. Failure means that the appropriate effect is not operative and no subsequent drinks from the Moon Pool will have any effect whatsoever for a number of days equal to the amount by which the character failed his saving throw. For that matter, while one effect is operative, subsequent drinks provide no additional effect, good or bad. Finally, Moon Pool effects cannot be dispelled by any known means; a character who has drunk from its waters must wait until the appropriate number of days has passed before its effects will fade. I keep pretty good track of time in my campaign, using the guidelines given in Volume 3 of the LBBs. Consequently, I know roughly what phase the moon is in if it ever becomes pertinent to play. However, not all referees are as fastidious about timekeeping and so the table above can also be used to randomly determine the current phase. As many of you know, I'm not a big fan of the Fiend Folio, for reasons I needn't mention again. However, I am a big fan of the artwork of Russ Nicholson, whose work on the FF is uniformly excellent and that I strongly associate in my mind with "British fantasy" -- a cynical and darkly humorous brand of swords-and-sorcery that's a perfect antidote to the squeaky clean, All-American look of Silver Age D&D artwork. Anyway, Coopdevil over at the Fighting Fantasist has noted that Mr Nicholson recently started a blog of his own. You may find it here. Enjoy! Chaosium's Basic Role-Playing (which I've lauded previously) was extracted from the rules of RuneQuest, simplifying and genericizing them in order to serve as a foundation for other RPGs. The first game to explicitly do so was 1981's Call of Cthulhu, whose rulebook, unlike that of its contemporary Stormbringer, referred back to Basic Role-Playing for an understanding of certain foundational mechanical concepts. BRP was thus intended as a "high level" document, establishing only the most basic principles of the game system, such as characteristics and skill rolls, while individual games dealt with the specific details of expanding upon those principles. 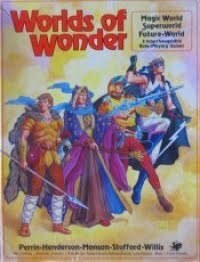 1982's Worlds of Wonder was another step along the road to showing how Chaosium wanted Basic Role-Playing to be used. This boxed set came with four short booklets (three are 16 pages in length and one is 18 pages). The first is BRP itself, while the other three each presents a different "world" (i.e. genre) in which to use the rules of Basic Role-Playing, complete with all the rules needed to play. Of course, "complete" is a relative term and there's no question that by most standards (even back in 1982), the world books were more like the skeletons of games rather than fully-fleshed out, ready-to-go games. Consequently, Worlds of Wonder has an "experimental" feel, as if Chaosium were testing the waters to see if how much BRP could be stretched beyond its roots in RuneQuest. The first of the three world books is Magic World, a fantasy game that is reminiscent of a between a de-Glorantha-ized RQ with some nods toward Dungeons & Dragons. Not huge nods, to be sure, but Magic World is very traditional in its presentation, largely lacking the idiosyncrasies that make RuneQuest so appealing to its fans and frustrating to its detractors (and might-have-been fans). As a BRP derivative, it's skill rather than class-based but starting characters must choose one of three "professions" -- warrior, rogue, or sage -- which determine the starting skills to which the character has access. Interestingly, the default assumption is that a new character is a rogue, as it has no entrance requirements, while becoming a warrior or a sage requires a roll to be accepted for training. As in RuneQuest, new skills are acquired through training (which costs money), while old skills are improved through use. Magic is potentially available to all, but it requires admittance to the Sorcerer's Guild to learn (again, with entrance requirements). The selection of spells is small and somewhat bland (compared to RQ, CoC, or Stormbringer anyway). Spells are divided between sorcery and ritual magic, with the former being magic one can cast on-the-fly and ceremonial magic requires greater time, expense, and concentration. Magic World includes a small selection of monstrous opponents, pretty demanding that referees either create their own or swipe them from other BRP games. Future World is the longest -- and densest -- of the three world books, presenting a science fiction world in a "galactic empire" vein, with the PCs assumed to be agents of ICE -- the Imperial Corps of Engineers, which, despite its name, is in fact an eclectic collection of troubleshooters for the Empire. Like Traveller, Future World characters begin play with prior experience. However, there's less randomness and more breadth to this prior experience, with players choosing which skills they wish their characters to have and the ability to switch professions multiple times, thereby allowing "cross training." Like Magic World, there are still entry requirements for certain professions, meaning that character generation is still somewhat at the whim of dice rolls. Several sample alien races and robots are presented, as is a great deal of equipment. Combat and other mechanics receive some large expansions, mostly due to the highly technological nature of weaponry. There are no starship rules -- travel is assumed to be via gates and ICE missions are all planet-bound, it seems -- or any planetary creation guidelines. There is a sample adventure included, which is odd, given its length (nearly five pages), which in my opinion could have been more profitably spent on including a few other sub-systems of use to science fiction gaming. Far moreso than Magic World, Future World very much feels like a sketch of a game rather than a complete game in its own right. Superworld (which would later be expanded into a full game of the same name) is a BRP treatment of the superhero genre. Characteristics are still rolled randomly, but any one that is below 11 is given a +3 bonus to bring it more in line with the expected level of character power. Adding together one's characteristics gives a pool of "hero points" with which skills, superpowers, and even characteristic boosts can be purchased. Hero points can also be spent on "energy points" by which superpowers function. More hero points can be acquired through taking on "disabilities" or in some way limiting a character's superpowers -- all standard fare for superhero RPGs. Superworld describes about 30 powers, many of which are quite broad and in fact encompass several sub-powers. Combat receives some modifications in order to better simulate four-color action (with knockback, etc. ), but is still very much in line with BRP's assumptions. There's a very short sample adventure (more a slugfest than a true scenario) and some notes on various topics of interest (referee's advice more or less). Also included are some designer's notes by Steve Perrin, who explains that Superworld grew out of his dissatisfaction with Superhero 2044, which he found contradictory and unsatisfactory to his needs. Worlds of Wonder was an ambitious project and one whose results were mixed. All three of the worlds have elements to admire, but, as I've said, they all require some amount of work on the part of the referee and players to become "proper" RPGs. For many, this is undoubtedly a plus, but, then as now, I suspect that many will lack the interest in becoming a "co-designer" with the good folks at Chaosium just to play science fiction or superheroes. Still, I can't help but think that Chaosium's approach of having a very basic -- in the "foundational" sense of the term -- set of core rules, with each game built on their foundation adding specific complexities, is a better approach than a huge, sprawling "generic, universal" philosophy. Games like HERO and GURPS simply hold no appeal for me, especially nowadays, whereas Basic Role-Playing's appeal is increasing, in part, no doubt, to its genuine elegance. It's a simple, straightforward system that's surprisingly robust and flexible, as Worlds of Wonder makes abundantly clear. Because the effects of range are so important, and because the ranges between specific characters can vary greatly, it is suggested that the complex combats be mapped out on a line grid (as shown in the diagram). Ordinary lined paper serves this purpose quite well. The grid consists of broad bands in which the characters are placed (use cardboard markers or cast metal miniatures to represent the characters). As you can see, miniatures are reduced to the role of mere markers on a range grid rather than anything more elaborate. When starships encounter in space, they may be forced to do battle as a result of desire or of circumstance. In such situations, starship battles may be resolved using miniature spaceship combat in accordance with the following rules. The implication here is that, unlike personal combat, which is natively much more abstract, starship combat is inherently a miniatures-based affair. This is supported further when, while describing the "Basic Parameters" of such combats, the chapter discusses "Space" and "Units:"
2. Space: A playing surface is required, representing space as a two dimensional surface at a scale of 1:63360000, or, in more familiar terms, one inch equals one thousand miles. The term inches and thousands of miles are used interchangeably in these rules, and refer to distance. Planetary templates may be made as discs on this scale also. 4. Units: Starships and space vehicles are individually represented by spacecraft miniatures, or (if necessary) by counters or markers. Because spacecraft miniatures are almost certainly oversize when compared to the scale in use, each such craft should be marked with a spot to designate the exact true nature of the ships in play. Throughout Book 2, the term "miniatures combat" is repeatedly used as a synonym for "starship combat," suggesting that, as original conceived, starship combat was in fact a kind of "sub-game" within Traveller and a miniatures-focused one at that.